Some of us want the best price we can get, some want luxury above all, and others would rather have something sporty to spice up their daily commutes. 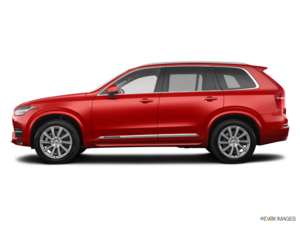 Fortunately Volvo answers all of the above with its base Momentum, sporty R-Design, and ritzy Inscription trims, while still providing plenty of value, performance and luxury in each. Along with its outwardly pleasing character the XC90 provides one of the more visually appealing and best executed interiors in the mid-size luxury SUV class, this particular model finished in classic black with satin-silver and optional carbon-fibre detailing, the leather-covered dash, door uppers, armrests and seat upholstery featuring sporty white contrast stitching, the light coloured thread coming standard, but all the fanciful leather made available due to a $3,000 Leather package that also includes rear side sunshades. 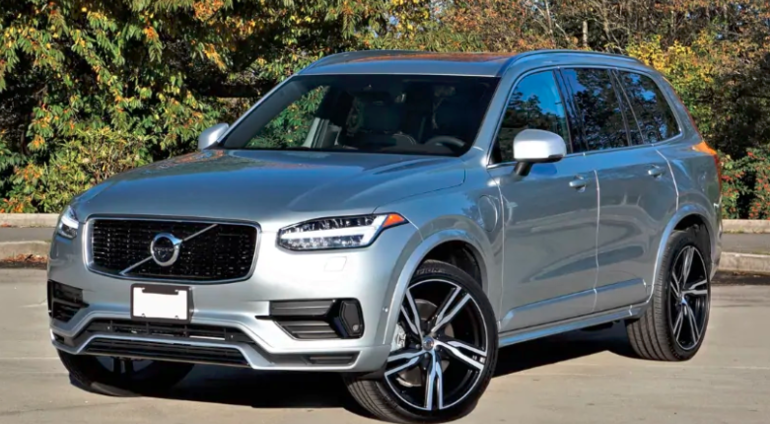 Of course, the XC90's finer detailing is more of a wants over needs issue, the beautifully detailed diamond-pattern bright metal rotating start-stop knob making a luxury statement all on its own, although it's backed up by a cylindrical drive mode selector shod in the same dazzling full metal jacket. These last three items are totally unique details that separate Volvo from any other brand, giving its cabin an upscale ambience that wouldn't feel out of place to a Bentley or Rolls-Royce owner. Over on the centre stack the XC90's vertically positioned 9.0-inch tablet-style Sensus touchscreen is better yet thanks to its multi-award-winning infotainment interface with ultra-familiar tap, pinch and swipe gesture controls. Truly, it's best of the best when it comes to user-friendliness and overall functionality, while its standard feature set, including a backup camera, four-zone climate control, navigation, real-time traffic info, voice activation, Volvo On Call app (with remote start, vehicle tracking, and more), Apple CarPlay and Android Auto smartphone connectivity, audio/radio functions, car settings, etcetera, leaves nothing to the imagination. Monstrous probably isn't the right word to describe T8 eAWD performance, as it's the most progressively linear 400 horsepower and 472 lb-ft of torque you'll likely ever experience. I've enjoyed the T8 around town, on long high-speed freeway trips and most every other type of roadway in between, and have grown to appreciate its relentless forward thrust as much as its smooth, refined demeanor. To be clear, it's fast, but it's no Mercedes-AMG GLE 63 S or BMW X5 M beater, and it's not even trying to be. Instead, Volvo has its sights on the Mercedes-Benz GLE 550e 4Matic and BMW X5 xDrive40e, its mid-five second sprint to 100km/h coming milliseconds from matching the former and annihilating the latter by more than a second, while its claimed fuel economy rating is 10.1 L/100km in the city, 8.8 on the highway and 9.5 combined compared to 11.1 L/100km combined for the Mercedes and 9.9 combined for the BMW. Volvo's small-displacement four-cylinder, twin power and plug-in hybrid combination certainly pays off in performance and at the pump. Of course, all of the aforementioned SUVs were designed to drive on electric power only for about 30 kilometres before automatically starting up their respective internal combustion engines and continuing on as hybrids-the T8's battery was upsized this year for an estimated 30.5-km of range from its two electric motors. While 30 km doesn't sound like a lot, if your commute is short it's possible to get to and from work without using any gasoline at all, but Volvo more realistically estimates the result of regular charging (which takes about three hours from a 240-volt charger) will reward you with an Le/100km (gasoline litres equivalent per 100 kilometres) rating of 4.7 combined city/highway. That would make a welcome improvement to my fuel budget, considering pump prices for regular unleaded in Vancouver are now averaging above $1.50/litre after hitting record highs of $1.65 in May, let alone premium unleaded that shot up to $1.87 last month. Similar to the formidable yet linear power delivery, the XC90's ride and handling compromise is wonderfully agile without any harshness. Even with my tester's optional Pirelli Scorpion 275/35R22s it remained comfortably compliant no matter the road surface, yet pushed hard through a serpentine set of switchbacks it lived up to its European performance pedigree. Adapting to your mood and/or surrounding conditions, Volvo allows for adjustable steering and Drive-Mode settings, the former modulating between low, medium and high steering assistance, and the latter featuring Comfort, Eco, Dynamic (sport) or Off-Road modes. It's a quick and easy system to set up, and makes a big difference to how the XC90 drives. Volvo backs up the XC90's confidence inspiring performance with a plentiful supply of advanced driver assistance systems, safety having always been core to the Swedish brand's ethos. It starts with auto on/off LED headlights with active cornering, forward collision warning with autonomous emergency braking (that even includes its own head-up display), lane departure warning with lane keeping assist, and rear parking sensors. No matter the trim, it all comes in an interior that's extremely comfortable and very roomy. Even the third row was spacious enough for my medium-build five-foot-eight frame to fit in without feeling cramped, leaving about an inch ahead of my knees when the second-row was pushed as far rearwards as possible. I had a couple of inches remaining over my head too, plus ample elbowroom thanks to armrest cutouts. Volvo also provides pillar-mounted air vents for superb third-row ventilation, these identical to those found on the backside of the B-pillars for second-row passengers, while roof-mounted LED reading lights benefit both rear rows.